Product prices and availability are accurate as of 2019-04-16 19:22:29 UTC and are subject to change. Any price and availability information displayed on http://www.amazon.com/ at the time of purchase will apply to the purchase of this product. If you have any problem, please feel free to contact with us. We will solve problem for you. Stand out on the sand inSEXYARN boldly printed bikini swimsuit. the sporty design is not only for beach holidays but also perfect for workout time! Made of good quality fabric that brings good breathability and sweat-absorption. 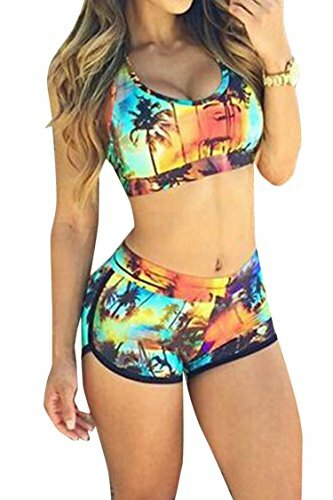 Two pieces tank top bikini set. Wihtout paddds and rims. The material is a litter thin. Machine washable. 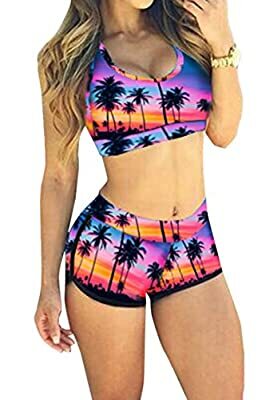 S:bust:32"-33",waist:24"-25",hip:34.5"-35.4"; M:bust:34"-35",waist:26"-27",hip:36.5"-47.5";L:bust:36"-37",waist:28"-29",hip:38.5"-39.5"; XL:bust:38"-39",waist:30.5"-32",hip:41"-42.5". If you have any problem, please feel free to contact with us. We will solve problem for you.